ABOVE: Excursion boat on Lake Thun. The phrase "Swiss transportation" conjures up images of mountain railways, cablecars, funiculars, and chair lifts. But in a land where nearly two-thirds of the surface area is covered by Alps, there's plenty of snow to melt in the springtime, and much of the resulting water ends up in large lakes. With all that liquid lying about, it's hardly surprising that Switzerland--the undisputed world leader in public transportation-- has developed a network of more than 100 boats on 14 lakes to serve tourists and its own citizens. 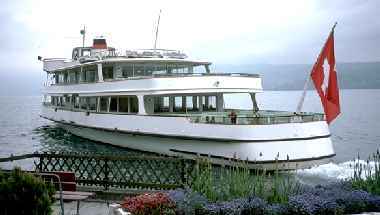 The typical Swiss lake steamer is either a modern diesel-driven boat or a traditional steam-driven sidewheeler. A few of the older steamers date back to the early part of the century. Regardless of their age or means of propulsion, the immaculate white vessels make a beautiful sight as they chug across the lakes with the red Swiss flag whipping above their wakes. Most boats have two decks--an upper deck for first class, and a lower deck for steerage. (TIP: Second class is perfectly comfortable, although first class is closer to the life rafts.) On some sailings, especially during the off-season, you may encounter smaller boats that make up in coziness what they lack in amenities. You'll normally find a buffet where you can get drinks and snacks. A few vessels have full-scale restaurants that serve up lunch, dinner, and nighttime entertainment during two- or three-hour cruises. It's a good idea to book ahead for meal cruises, which frequently attract locals whenever the weather is decent. NOTE: Although tables can be reserved for meals, it's strictly open seating in the lounges and on the decks. If it isn't raining or unduly cold, find yourself a chair or bench in the open air and enjoy the scenery. Ticket prices vary with distance and class of service. You can spend anywhere from a few francs for a short crossing to a fairly hefty price for a circular cruise on one of the larger lakes. Accompanied children under 16 travel free if you've obtained a Swiss Family Card. If you plan to tour Switzerland without a car, you should consider buying a Swiss Pass from your travel agent before you leave home. The Swiss Travel Pass gives unlimited travel on the Swiss Federal Railways, postal buses, lake steamers, city buses, and streetcars for periods that range from a few days to a month. Within Switzerland, you can also buy regional passes such as the Berner Oberland Card that offer various discounts. For more information on transportation discounts, see our article on Swiss Rail Passes. ABOVE: Steamers in convoy on Lake Thun. Lake Z�rich. You'll encounter commuters, school groups, and retirees on the boats that connect the Z�rich waterfront to pleasant suburbs on both sides of the lake. The longest route goes to Rapperswil, about two hours away. The season runs from early April to late October. Lake Geneva (Lac L�man). You can tour this big lake in a single day, but it's much nicer to break up your journey with overnight stays in Lausanne, Montreux, or other cities along the shore. Even better, use the boats as an alternative to the train on your way to or from Geneva at any time of the year. Lakes Thun and Brienz. These sister lakes are on either side of Interlaken ("between the lakes") in the Bernese Oberland. The Thunersee is open to the sky and almost subtropical in ambience, while the Brienzersee is hemmed in by mountains and forest. Passenger boats run from April to late October. Lake Lucerne (Vierwaldst�ttersee). Boats on Lake Lucerne, also known as the Lake of the Four Forest Cantons, sail mostly from spring through fall. The Lucerne-Brunnen route operates throughout the year. To enjoy the many villages along the shore, simply leave the boat whenever you see an appealing spot and catch another boat in an hour or two. Lakes Neuch�tel, Biel, and Murten. These three lakes are joined by canals. You can sample all in one day with the Drei-Seen-Fahrt or Tour des troi lacs circular excursion that leaves Biel/Bienne at 9:50 a.m., stops at Murten on its way to Neuch�tel, and arrives back at six o'clock. Other boats offer shorter cruises and crossings on the individual lakes. Lake Lugano. This large mountain lake between Switzerland and Italy is shaped like a wishbone, and cruising opportunities range from local excursions to half-day trips. The season runs from spring through fall, and the regional boat pass is a good value for frequent sailors. Lake Maggiore. From the sunny resort town of Locarno, you can sail to Arona, Italy and catch a train via Domodossola to Lake Geneva or the Bernese Oberland. If you're less ambitious, it's only a 20-minute boat ride to Ascona, a traditional refuge for well-heeled artists and celebrities. Other lakes. 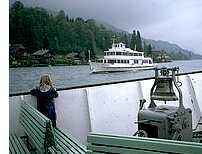 The Halwilersee, Zugersee, �gerisee, and Greifensee have scheduled sailings. Boats on Lac de Joux and Lac des Brenets occasionally run charter excursions for groups. The German Federal Railways operate steamers on the Bodensee (Lake Constance), which you can board at various points in Northeastern Switzerland. Ride an antique paddlewheel ship to Fluelen, or combine shorter excursions with a train trip as you explore Switzerland's most popular lake.